More than 8'500 people died in Nepal after the earthquake of April 25th 2015 with the epicenter in the north-west of Kathmandu. A massive number of people lost everything - especially the poor inhabitants of the mountainous areas near Kathmandu. The reconstruction of the destroyed buildings will take many years. 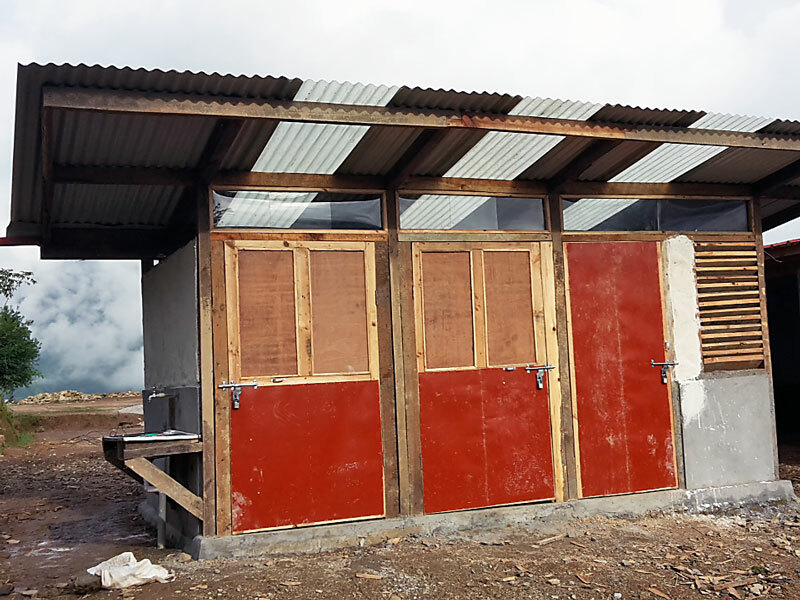 ROKPAs focus is on the reconstruction of schools in remote areas. Although the reconstruction took over 2 months longer than planned due to unforeseen events, ROKPA only had to slightly overstretch the original budget. We are very satisfied with the completed work. The school has already resumed classes in the new classrooms. 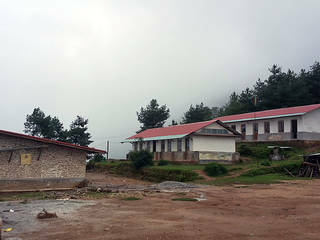 “The schoolchildren I talked to are very happy with their new school. The quality of the 3 buildings constructed and renovated by ROKPA are unparalleled in this region,” Federico recounts proudly. 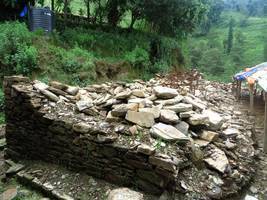 Dhanmale School: Dhajji-walls to protect the school from any future Earthquakes. 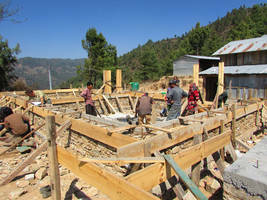 Dhanmale School: Many women are also part of the building team. Jiri Monastery: 30 monks attend the Jiri monastery school. Jiri Monastery: Foundation concrete work for the new hostel. The school buildings all suffered major damage. 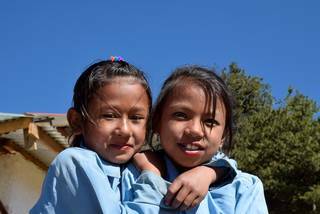 Before the earthquakes of 2015, it offered a nursery and classes up to grade 8 for 236 children aged between 5 and 16. 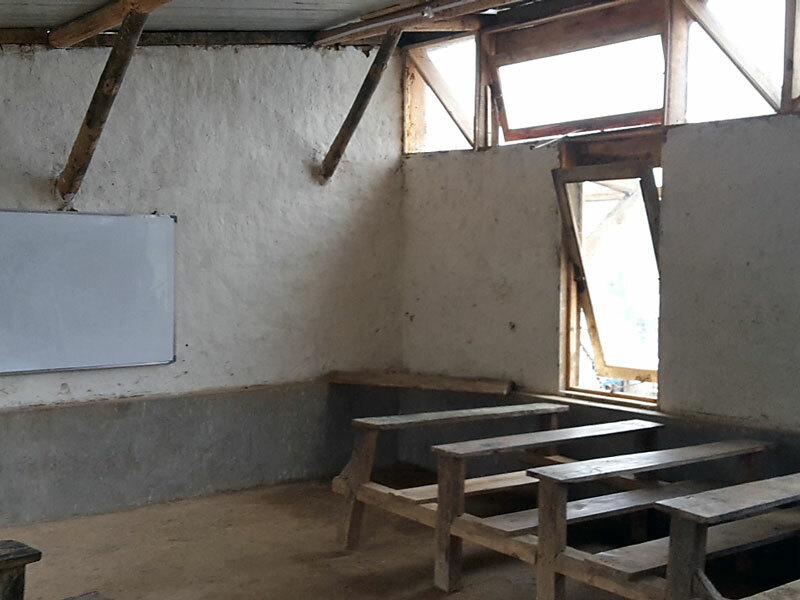 ROKPA started rebuilding the school in February and the works should be terminated by the end of July 2016. 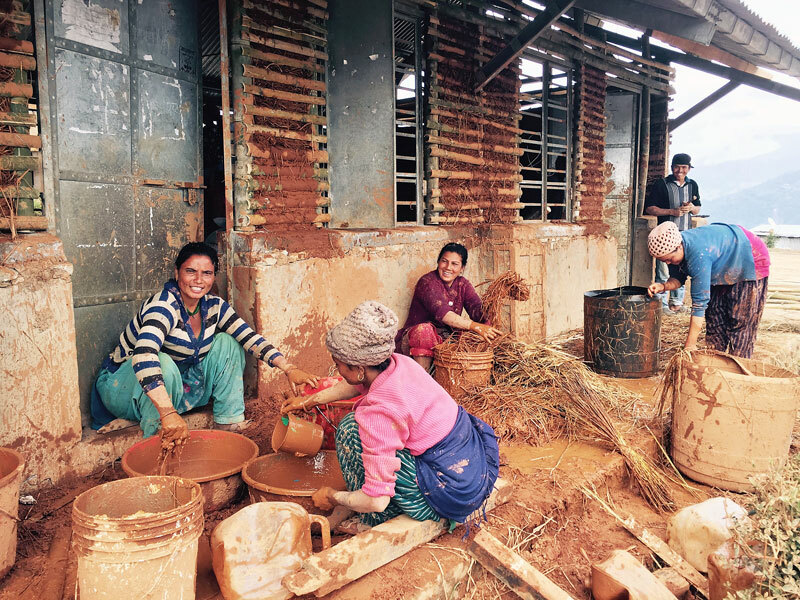 Sustainability and local production being an important principle for ROKPA, timber, clay and rocks are being sourced from the Dhanmale area, other materials come from the nearby Jiri and Mainapokhari and some from Kathmandu. The newly constructed buildings are built with ” Dhajji walls” (see pictures): they are a style of construction used in Pakistan and Northern India to resist the destructive power of earthquakes. 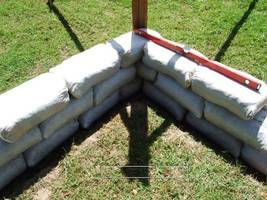 Using timber frames with diagonal elements, filled with tight stone masonry makes for a solid and safe wall. 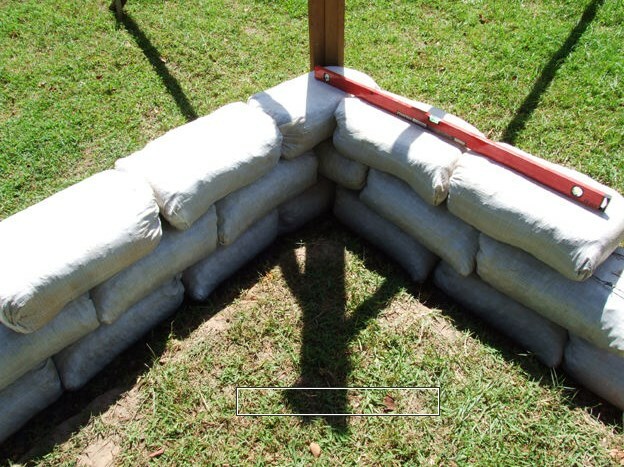 The wall infill should end soon, leaving window making and installation, plastering and roof to be done. All the workers come from the local community, the longest trip being a 30 minutes walk. 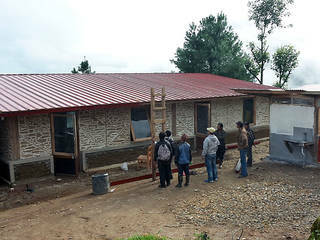 Since the beginning of May the same building crew as for the Dhanmale School is working on the rebuilding of the Hostel for 30 monks of this small monastery school that was badly damaged by the earthquakes. 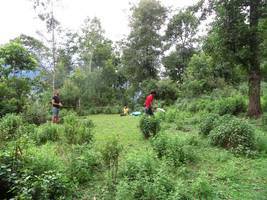 It is situated in the Jiri Region as well, close to the Dhanmale project. 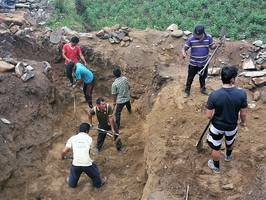 The plan is to finish foundation concrete work as soon as possible and install the corrugated iron roof to protect the works and allow continuation despite the monsoon. The blockade of the Indian-Nepalese border paralyzed the freight transport from India to Nepal for several months. 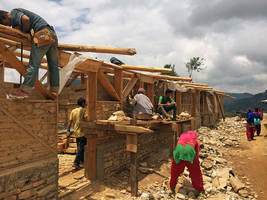 This led to shortage of gas and building materials, making the rebuilding process after the Earthquake very difficult. The blockade has been officially declared ended by now. Supply conditions are slowly getting back to normal. 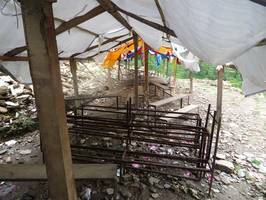 A school in the mountainous region of the Jiri disctrict, about 10 hours by bus from Kathmandu: Of the 5 school buildings, two were completely destroyed and one severely damaged by the earthquake. 236 pupils aged 5 to 16 years are enrolled at this school; the educational offer covers everything from kindergarden up to 8th grade. Ten teachers currently give their lessons in temporary barracks at confined space. 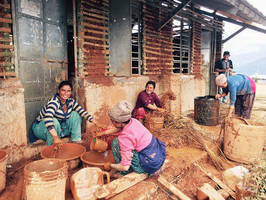 ROKPA covers the costs for the reconstruction and works closely with the local population. 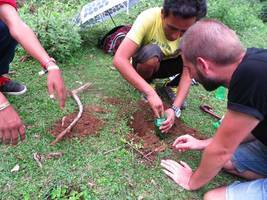 We are supported by two volunteers: an architect from South Africa and a draftsman from Australia. Most of the ladies who work in the ROKPA Women's Workshop have been with us for many years. ROKPA has now sponsored new houses for them as their rented rooms had all been gravely damaged by the earthquake. The houses may not look like much to us here, but to them they represent their whole universe and a security they never knew before. Before many had to beg in the streets - Now they have secure jobs, their children have been sponsored through school and College and -cherry on the cake: they own their own little houses now! This part of the school building was completely destroyed by the earthquake. 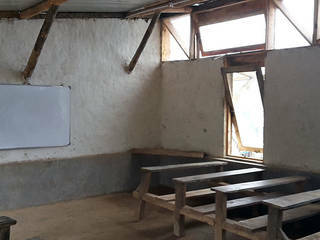 The temporary classroom after the earthquake. Cheap and earthquake-proof: rice bags filled with soil build the external walls for the new school (picture taken from another project). The architect and the principal taking soil samples for construction. Measuring the planned building on the new premises. Patric, a volunteer ROKPA project coordinator has spent the past few weeks preparing an evaluation of potential reconstruction projects. 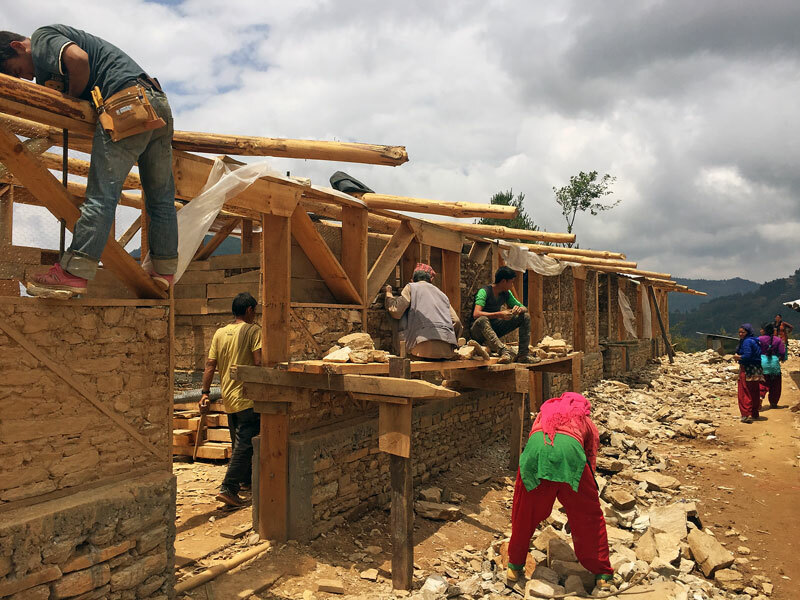 Besides our financial contribution to the construction of a sewing workshop (see update from 9th of July), we have decided as a next step to rebuild a school in the district of Sindhupalchok. This school was almost completely destroyed by the earthquake. It was attended by around 200 children and consisted of 8 classrooms and a kindergarten. Our committed architect on site wishes to rapidly push ahead with the construction, so that the children can go back to school by the end of the year. 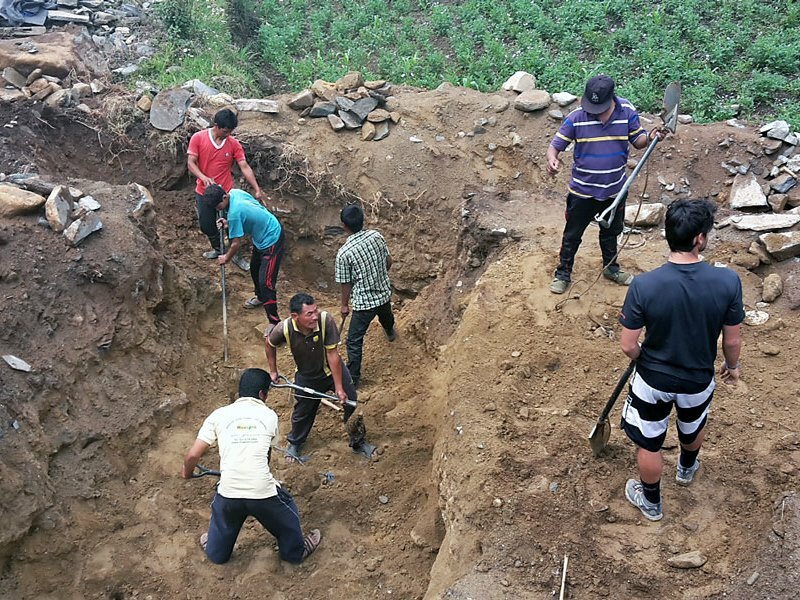 As the small road to the area is impassable for trucks at the moment due to the monsoon, we are planning to use an unorthodox but proven construction method: rice bags filled with soil are placed on top of each other to build the walls of the new building. 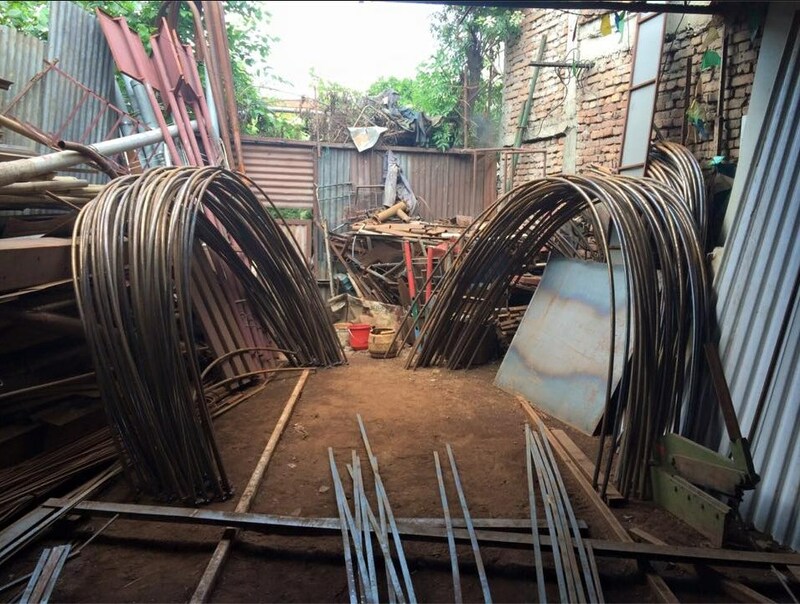 Iron girders for the roof frame can be taken from the destroyed old school building. 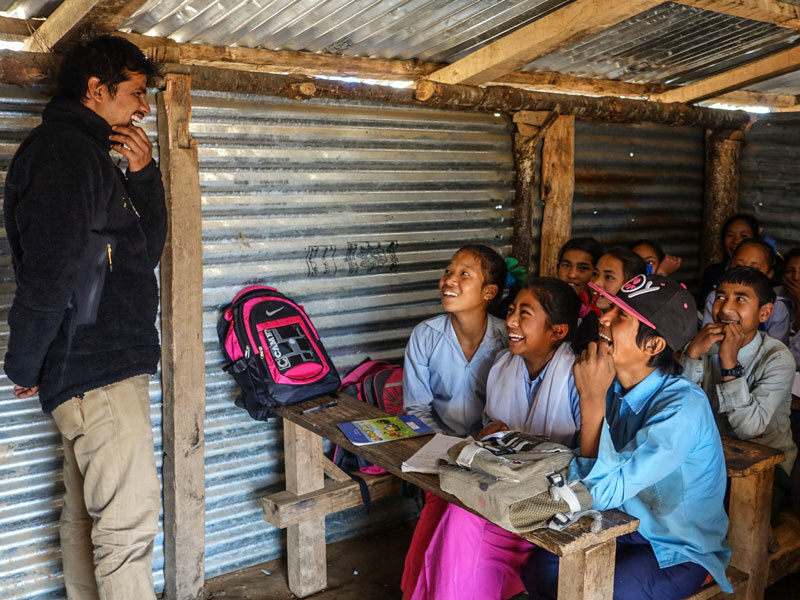 A couple of days ago the Nepali government announced that the reconstruction of schools will only be permitted if they comply with a new catalogue of criteria. We therefore have to wait until this catalogue is published. We assume, however, that only minor changes will need to be made to our original project planning. The ROKPA Children living in tents on the empty land. Metal parts for the new emergency shelters to be built. Our Task-Force was on the road for the past 3 weeks shipping relief supplies to remote villages. About 150 people have been treated medically. 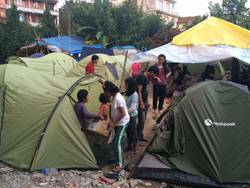 More than 6 tons of food, 70 tents and almost 170 tarps have been distributed to about 800 households. By now, many people have received assistance in one form or another. As ROKPA is not specialized in these kinds of emergency action, we now want to focus our activities on the long-term help in reconstruction. The next big challenge will be the monsoon season, which brings a lot of rain from June to August. 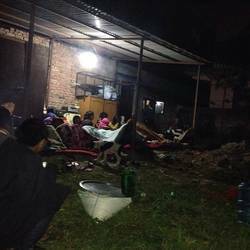 Thousands of Nepali have been without shelter since the Earthquake. 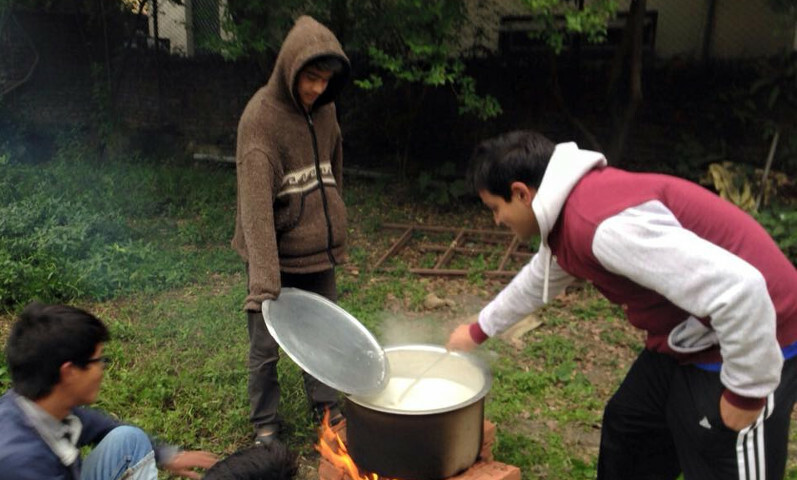 ROKPA therefore concentrates on building emergency shelters on the free land next to the Children’s Home. 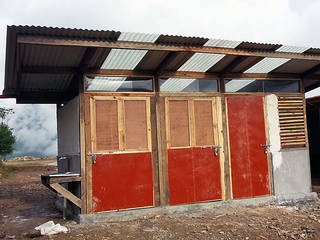 The tents are replaced by solid shacks, latrines are installed. 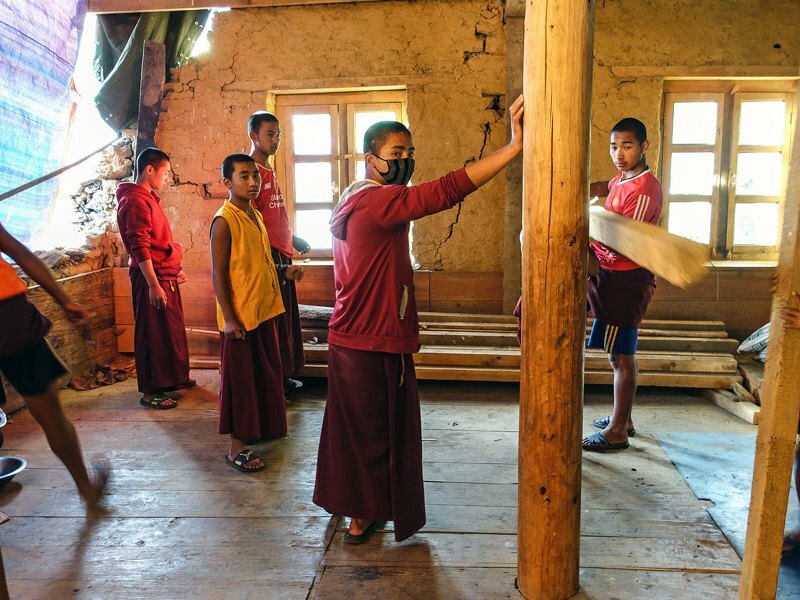 Experts examined the ROKPA Children’s Home again after the second heavy Earthquake and they state that it’s safe – this time though “without taking any responsibility for additional hidden damages”. Therefore the children sleep outside for the time being and help in building new shelters. 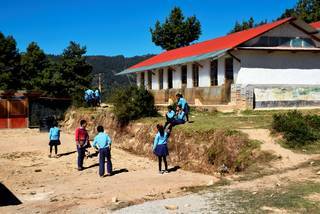 Schools are still not running in Kathmandu yet. Just to let you know that our children are ok. All of them were in our dining room saying prayers before lunch when it happened so having had training of what to do , they all ran outside. Since then they have been sitting on your new land opposite the Children's Home and even cooked there. They will sleep there too as it is not safe to go back in. BJ, ROKPA child, now manager there, has been amazing and immediately after managed to let me see them and greet them through skype. But mostly the contact is cut off. We don't have any news of some of the older children who were outside and if relatives and friends. I have been getting messages and queries from all over the world. Thank you for your compassion. So whatever help you can give now and collect will be enormously appreciated ! Thank you for your kindness!